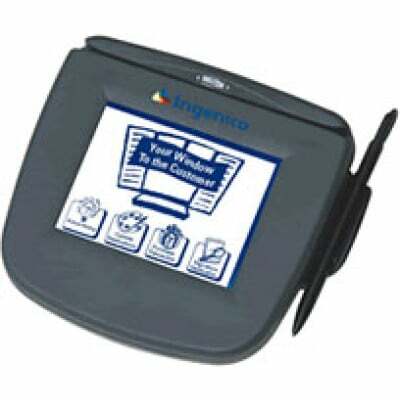 Ingenico eN-Touch 1000 Payment Terminal - Big Sales, Big Inventory and Same Day Shipping! Ingenico has shipped over 300,000 eN-Touch 1000 terminals to major retailers for electronic signature capture and online debit PIN entry. eN-Touch 1000, Signature terminal with LCD monitor, 4 x 3 in - wired - serial. Requires key injection in order to accept debit or credit card payments. Please call for more information. eN-Touch 1000, 512KB Flash memory, 12VDC, 1.2A. Requires key injection in order to accept debit or credit card payments. Please call for more information. eN-Touch 1000, KIT, for RBA, 512KB, RS-232, 2 TRK, STYLUS. Requires key injection in order to accept debit or credit card payments. Please call for more information. eN-Touch 1000, USB, 512MB 2 track STYLUS. Requires key injection in order to accept debit or credit card payments. Please call for more information. RS-232 Cable with DB9 Pigtail Power connection. 15 ft., Black. See (Part# PE00732) for required power supply, not included.